Tech Tent: What price a folding phone? Finally something new! After years of every new mobile phone looking identical, we are being offered something radically innovative, a folding device. On this week's Tech Tent, we ask whether folding phones are the next big thing - or just a niche product for early adopters with money to burn. 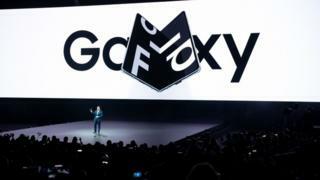 Samsung's Galaxy S10 Fold was the star of its big launch event held in San Francisco on Wednesday. A couple of days before I'd been given a sneak preview of the other phones to be unveiled in the flagship Galaxy S range, handsets which will sell in far greater numbers than the folding version. The new Galaxy S10 - the latest model of what has been a phenomenally successful device for the world's leading manufacturer - is pretty impressive. With its huge screen curving round the edge of the device, a camera with three lenses including a wide angle option and all sorts of AI to optimise its performance, it is probably the best smartphone you can buy right now. But it is, like all of its rivals, another rectangular slab of black glass. And if you tried to explain to someone who was not an avid consumer of smartphone spec sheets what was so different and new about it, you would struggle. That is why there is so much excitement over the Galaxy Fold. It isn't the first folding screen - China's Royole showed one off at CES in Las Vegas last month - and more will follow at Mobile World Congress in Barcelona next week. But Samsung rivals Apple as a thought-leader in the mobile industry and so when it takes to the stage and says, "This is what the future looks like", the world sits up and takes notice. The demo of the smartphone that unfolds to become a tablet was punctuated by applause, and the way the content switched seamlessly between the screens looked impressive - even if nobody outside Samsung has been allowed to get their hands on the device. But then came the announcement of the price - a startling $1,980 (£1,515) - and the audience exhaled as if to say, "Really?" Since then, the reaction to the Galaxy Fold's luxury price tag has been divided. Some have defended it, pointing out that you get essentially two high end smartphones for your money, and are getting in early to a revolutionary product. Here's gadget blogger Holly Brockwell: "You really can't be upset about the price of the #GalaxyFold. It's a brand new category, an amazing piece of tech with specs & software to match. Samsung is taking a risk launching the 1st big-brand foldable. Price will come down, but it's worth the money. Just wish I had it." Our man in San Francisco, Dave Lee, was at the launch and confirms that there was plenty of sucking in of teeth when the price was announced. But he points out that the first HD televisions cost something like $7,500 and he now has one that cost $250. But is a device with a folding screen, even if the price tumbles, really a transformative product that everyone will eventually want, just like the smartphone or the high definition television? I'm not so sure. It seems like product for quite a niche audience of people who are keen on tablets but think it would be easier to carry one around if it folded up and could be put in a pocket. Predicting consumer taste in gadgets is hard. Our special guest Kate Bevan is editor of Which? Computing and brought in the first edition of that magazine from 1999. The cover feature was about compact digital cameras, which cost as much as £800. They took off, the price tumbled but they were eventually rendered almost obsolete by mobile phones. There was also a letter from a reader asking whether he could use the internet when out and about by combining his laptop and mobile phone. The answer was yes, but it was quite a complex business - making the mobile internet easy has been the transformative technology advance of the last twenty years. I somehow doubt many people are writing to tech websites today asking whether they can find a phone that folds up. But maybe 20 years from now we will be looking back on 2019 as the year when the era of dull old rectangular slabs of black glass came to an end.